A Scottish bus manufacturer has signed a deal potentially worth £2bn to build vehicles for the world's biggest producer of electric buses. The agreement between Alexander Dennis Limited (ADL) and Chinese firm BYD came during the UK state visit by Chinese president Xi Jinping. There's a battle to dominate the battery business, and the deal with Alexander Dennis brings the Scottish bus-builder on board. It is the bit of consumer electronics and transport that has lagged other technologies, but the deal for all-electric buses from Falkirk is a potentially important part of the effort to revolutionise energy storage and its uses. BYD is leading the charge for China. The Chinese firm is 20 years old and employs 180,000 people, boasting the largest global market share of mobile phone and rechargeable batteries. On the other side of the Pacific, its rival is Tesla, which is also pushing into the transport market. Both are ramping up their battery production and innovating to find the best, most efficient ways to power cars, buses and trucks. BYD already has a bus operating in China, and trials in California. While it is selling electric cars in its home market, its export strategy appears to focus on establishing its brand in commercial vehicles, and from that base, it could plug into the car market. The deal with the Falkirk bus-builder appears to reflect problems BYD has had in building sufficiently robust bodies for road conditions. While chassis production is expected to start in China, the Scottish company hopes to attract that role as well. The most recent market update from Alexander Dennis is upbeat - expecting 20% growth in revenue this year towards £600m, with profits up too as it invests in its plant. It has big orders for Hong Kong and Kuala Lumpur, while orders for New Zealand and Toronto will be built at plants nearer the customer. 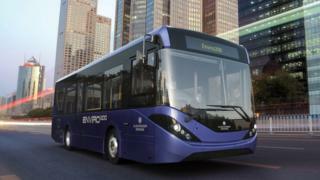 Image caption Discussions to build all electric double deckers are said to be at an "advanced stage"